Diane Exavier (East Flatbush) creates performance events, public programs, and games that challenge viewers to participate in the active realization of a theater that rejects passive reception. She is also an arts educator with a pedagogy that focuses on creating reflective spaces for young people. Her work has been presented at Westmont College, California State University: Northridge, New Urban Arts (Providence), West Chicago City Museum, and in New York: Bowery Poetry Club, Dixon Place, Independent Curators International, Medialia Gallery, and more. Her most recent play Good Blood was workshopped in residency with the Flea Theater. Her writing appears in Cunjuh Magazine, Daughter Literary Magazine, The Atlas Review, and The Racial Imaginary: Writers on Race in the Life of the Mind. 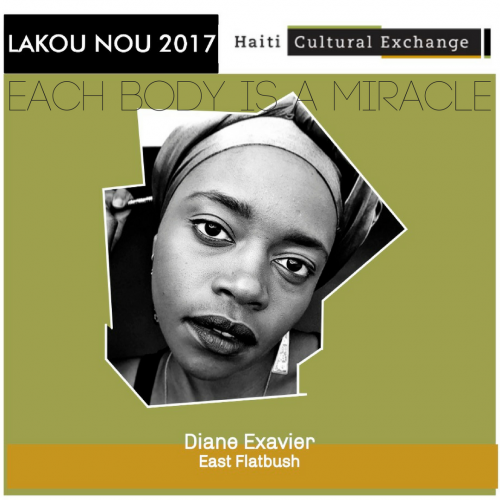 She uses her Lakou NOU residency to develop her original play Good Blood. With “Each Body is a Miracle,” Exavier delves deeper into some of the play’s issues and themes of immigration, partnership/intimacy, and health through social practice. She segments her project into three parts: 1) field notes, where she asks, what health issues are most affecting the lives and bodies of Haitian community members in East Flatbush today? 2) community crafting, where she’ll facilitate a floral crown making workshop, related to the Haitian traditional practice of plasaj, where participants of any age can attend and through a brief meditative exercise, decide the conditions under which they want to live, and 3) reportage, an exercise in active dramaturgy, combining research and documentation with live performance. She aims to compile her field notes into a brief report on pertinent health issues facing Haitian residents in East Flatbush and create a photobook sharing portraits from the Community Crafting event. Both will be available to view and peruse at a final reading of Good Blood, the play that serves as inspiration to this entire residency. RSVP to the Facebook event for Part 2 here! RSVP to the Facebook event for Part 3 here! This entry was posted on Thursday, October 19th, 2017 at 3:35 pm	and is filed under Archive, HCX Programs, Lakou NOU, Literature, Uncategorized. You can follow any responses to this entry through the RSS 2.0 feed. You can leave a response, or trackback from your own site.